Introduction High prices for insulin pose a barrier to treatment for people living with diabetes, with an estimated 50% of 100 million patients needing insulin lacking reliable access. As insulin analogues replace regular human insulin (RHI) globally, their relative prices will become increasingly important. Three originator companies control 96% of the global insulin market, and few biosimilar insulins are available. We estimated the price reductions that could be achieved if numerous biosimilar manufacturers entered the insulin market. Methods Data on the price of active pharmaceutical ingredient (API) exported from India were retrieved from an online customs database. Manufacturers of insulins were contacted for price quotes. Where market API prices could not be identified, prices were estimated based on comparison of similarity, in terms of manufacturing process, with APIs for which prices were available. Potential biosimilar prices were estimated by adding costs of excipients, formulation, transport, development and regulatory costs, and a profit margin. Results The manufacturing processes for RHI and insulin analogues are similar. API prices were US$24 750/kg for RHI, US$68 757/kg for insulin glargine and an estimated US$100 000/kg for other analogues. Estimated biosimilar prices were US$48–71 per patient per year for RHI, US$49–72 for neutral protamine Hagedorn (NPH) insulin and US$78–133 for analogues (except detemir: US$283–365). Conclusion Treatment with biosimilar RHI and insulin NPH could cost ≤US$72 per year and with insulin analogues ≤US$133 per year. Estimated biosimilar prices were markedly lower than the current prices for insulin analogues. Widespread availability at estimated prices may allow substantial savings globally. Severe problems in access to affordable insulin exist in low-income and middle-income countries. The global insulin market is dominated by three companies, with little competitive biosimilar manufacture. We estimated that, if there were a competitive biosimilar market, treatment with biosimilar insulins could cost US$72–133 per year or less. Increasing competition in insulin manufacture could lead to large price reductions, potentially enabling the scale-up of access to treatment. Little has been published on the costs of production of biologics, insulin or its analogues. The aim of this study was to estimate the cost of production and, on this basis, potential prices for biosimilar human insulin and insulin analogues that would be possible with large-scale, competitive manufacturing. Our analysis is made primarily with resource-limited settings in mind and from the perspective of government procurement. This study was undertaken as part of the Addressing the Challenge and Constraints of Insulin Sources and Supply (ACCISS) study, which aims to improve access to insulin. The study is co-led by Health Action International, Geneva University Hospitals and the University of Geneva, and Boston University School of Public Health. We designed formulae for estimating competitive but profitable prices for insulin biosimilars, based on the cost of API and excipients, costs of formulation into phials, development and regulatory cost, and a margin to account for operating expenditures and profit. For two central assumptions, the cost of API and the cost of formulation, we used high and low assumptions, resulting in a range of estimated prices: a ‘competitive’ formula and a ‘conservative’ formula. The lower assumption represents a scenario of a well-functioning market of numerous biosimilar manufacturers, and the higher end of the range represents a more conservative estimate. Both formulae, using insulin glargine as an example, are shown in figure 1. Details on the derivation of this formula are described below. Price estimation formulae for biosimilar insulin glargine. API, active pharmaceutical ingredient. All monetary values are in US dollars. Per-kilogram prices of API exported from India were collected from an online database of exports data published pursuant to Indian customs regulations (www.infodriveindia.com), for the period 1 January 2013 to 1 November 2016. After data cleaning to exclude any non-API product (eg, final finished product shipments) and censoring outliers (a small number of low-volume shipments at very low prices, ≤US$5 000/kg for human insulin and ≤US$10 000/kg for insulin glargine; see online supplementary figure 1), linear regression models were used to calculate average API prices for 1 November 2016 (online supplementary figures 1 and 2). For insulins where API export data were unavailable or insufficient, we took two further approaches to arrive at an estimated cost of API: direct solicitation of price quotes from API manufacturers, and inference of cost of production based on similarities in method of synthesis to APIs for which price information was available from other sources. In the ‘competitive’ formula, we subtracted 20% from the estimated API price to account for prices of exported API likely including numerous mark-ups that could be avoided by inhouse manufacture or by domestic procurement. Although little data are available on API mark-ups, this assumption is based loosely on mark-ups of 15%–30% reported for API of HIV medicines.12 As the HIV medicines API market is highly competitive, one would expect that this is a low estimate with regard to the less competitive insulin API market, making this assumption conservative in the context of this analysis. The considerations in estimating API price are further outlined later in the methods. The cost of API required to manufacture one 1000-unit phial was calculated by multiplying the milligram amount contained in 1000 units of the given insulin type (online supplementary appendix) by the per-kilogram API price. Excipient contents by insulin type, and their average prices, are given in online supplementary appendix. In confidential communications, biosimilar manufacturers confirmed that for recombinant molecules that have a high level of similarity, it is likely that the inherent cost of upstream processing is very similar. A range of estimates for the average cost of formulating API into phials are available. Another source formulation costs are the ‘conversion cost norms’ published in 2012 by the Indian government, as part of price control legislation.24 These norms were used by the government to calculate ceiling prices for medicines until 2013. The conversion, packing and packing material cost ‘norms’ combined were US$0.09 for a 10 mL phial (online supplementary appendix). The ‘norms’ prescribed an assumed wastage rate for raw materials during formulation at 4.5% of API, which we included in our formulae. Lastly, the prices of the lowest priced products formulated as phials, sold in the UK, can be used as high estimates of their formulating costs (assuming they are not sold at a loss). The prices of the five lowest priced products formulated as phials ranged US$0.64–0.85/phial (online supplementary appendix). We assumed a range of cost levels for 10 mL phial formulation, which include the phial itself and the cost of filling: a higher level of US$1.00/unit in the ‘conservative’ formula, based on the prices of the cheapest phial formulation products in the UK, and a lower level of US$0.09/unit in the ‘competitive’ formula, based on the values prescribed in the Indian government ‘norms’. An estimate by the US Federal Trade Commission put the cost of bringing a biosimilar to market (development, capital expenditure and regulatory costs) at US$100–200 million in markets with stringent regulatory authorities.25 The cost of bringing a biosimilar to market in India has been estimated to be 90% lower than this.26 We assumed that the cost of bringing a biosimilar to market was US$100 million, recouped over 5 years. Additionally, we assumed that 1 million patients (or about 5% of the estimated number of patients with type 1 diabetes globally)1 would purchase insulin from any new biosimilar manufacturer—approximately equivalent to the yearly rate at which insulin analogues have displaced human insulin from the market in high-income countries.11 Therefore, an additional US$20 per patient per year would be added to the cost of production, for the first 5 years that the hypothetical biosimilar is available. Costs of excipients were added based on prices listed online by large chemical manufacturers and typical excipient composition (online supplementary appendix). We added an additional 20% margin for operating expenditures and profit. We undertook a sensitivity analysis on these cost assumptions. An analysis by IMS Health estimated that for diabetes medicines, importation and distribution costs added 23% to the manufacturer price in Brazil, 23% in India, 41% in Indonesia and 11% in South Africa.27 Therefore, to allow comparison of estimated prices with reported government procurement prices, we added 20% to represent the cost of importation and distribution. Some insulin manufacturers report the total expenses in cost of production (termed ‘cost of goods sold’) as a percentage of sales. While it is not possible to definitively calculate per-unit costs of production from these reported percentages, we separately estimated the cost of production based on these reported expenses (online supplementary appendix). Sufficient data were available only for Novo Nordisk, but not for Sanofi or Lilly. Neither patients nor the public were involved in the research. Sufficient data on the price of exported API were available for RHI and insulin glargine. RHI had an average price of US$32 228/kg on 1 November 2016. Shipments to the USA demonstrated two ‘plateaus’ at US$70 000/kg and US$58 000/kg price levels, both price levels significantly above the pricing of exports to other regions (online supplementary figure 1). Another plateau was visible for exports to Mexico, at US$26 000–28 000/kg. The consistency of the price and order sizes within these plateaus suggests recurring orders between individual buyers/manufacturers. If shipments to the USA were excluded from the data set, linear regression yielded an estimated price of US$24 750/kg (decreasing by an average 18% yearly). This value, after removing exports to the USA, was used in production cost estimates. The volume of RHI API exported from India roughly doubled during the time frame studied, from 484 kg exported in 2013 to 793 kg in 2016 up to 1 November, the latter equivalent to about 1.6 million patient-years of treatment or 22.7 million 1000-unit phials. The linear regression model for insulin glargine gave an average price of US$68 757/kg (decreasing by an average of 27% yearly) on 1 November 2016 (online supplementary figure 2). A plateau was evident for exports to Mexico at around US$80 000/kg. API price quotes from biosimilar manufacturers were received for insulin aspart and none for other analogues. In insulin neutral protamine Hagedorn (NPH), protamine and insulin are combined as crystals in a molar ratio of approximately 8.5:1 (online supplementary appendix). Protamine sulfate is available commercially for US$6550–10 800/kg. As the molecular weight of RHI and protamine sulfate is similar, insulin NPH API cost can be estimated by assuming it is 89% by mass composed of RHI costing US$24 750/kg and 11% protamine sulfate costing US$10 800/kg. This yields a per-kilogram insulin NPH API price of US$23 282. Insulin aspart is different from RHI in 1 of 51 amino acids. Quotes were received from two manufacturers for insulin aspart, at US$87 720 and US$116 108 per kilogram. Both manufacturers were based in China. Based on the quotes received from the manufacturers, we estimated an API cost for insulin aspart of US$100 000/kg. This is about four times our estimate (based on observed shipments) for RHI. Insulin lispro and glulisine are each different from RHI in 2 of 51 amino acids. Lispro was the first analogue to be developed, and its manufacturing process for insulin lispro is nearly identical to that of RHI.14 We assumed that their API costs are the same as that for insulin aspart—US$100 000/kg. Insulin detemir and insulin degludec differ from RHI by their lack of the last residue on B chain and the attachment of a fatty acid group in its place. For originators detemir and degludec, the addition of the fatty acid groups is done in vitro, after purifying from the producing cell a human insulin-like precursor modified to lack the B30 residue.18 28 The fermentation and recovery aspects are common to RHI, detemir and degludec production.28 The fatty acids are commercially available at low cost. Given the small difference in amino acid sequence, the relatively simple process of adding fatty acid chains and the low cost of reagents, we assumed the cost of detemir and degludec API to be equal to that for the aspart, lispro and glulisine analogues. However, due to its dosage in milligram terms being three times that of the other insulin analogues, the estimated price for insulin detemir was significantly higher (see below). Final price estimates are given in table 1, and a full costing breakdown is available in online supplementary appendix. Assuming a dosage of 40 units/day (WHO defined daily dose for insulin), these estimated prices translate to a cost per patient per year of US$48–133, except for the cost of detemir, at US$283–365 per year. The estimated biosimilar prices are set in context in figure 2, where they are compared with recent government procurement prices in various countries reported by the ACCISS study4, as well as UK government-purchase prices reported in the British National Formulary and US prices government-purchase prices reported by the US Veterans’ Affairs Committee.29 30 Current prices of RHI were at a median of 1.2–1.8 times the estimated prices. Current prices of insulin glargine were at a median of 5.6–7.8 times the estimated prices, insulin lispro prices were at 2.7–3.7 times the estimated prices, and insulin aspart prices were at 2.6–3.5 times the estimated prices. It is important to note that the countries included in price comparisons differ by type of insulin, and government procurement prices reported by the ACCISS study are for any presentation (phial, prefilled pen, cartridge), while our estimated prices are for phials only. Prices of insulins in selected countries: (A) regular human insulin, (B) insulin glargine, (C) insulin lispro and (D) insulin aspart. Prices are for 10 mL (1000 units) in government procurement and for any presentation. Data from the ACCISS study4, the British National Formulary, and the National Acquisition Center (CCST) Pharmaceutical Catalog Search tool. ACCISS, Addressing the Challenge and Constraints of Insulin Sources and Supply; GCC, Gulf Cooperation Council; PDR, People’s Democratic Republic; UNRWA, the United Nations Relief and Works Agency for Palestine Refugees in the Near East. 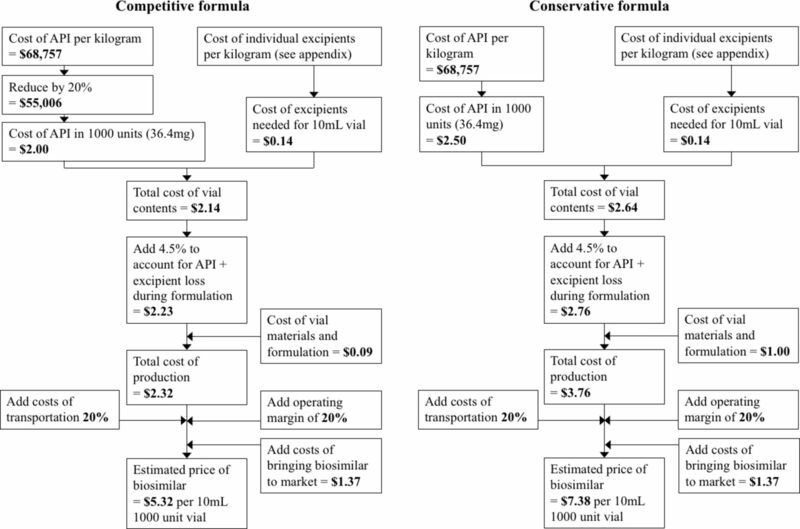 Across the different potential assumptions discussed in this analysis, the final estimated prices were most sensitive to the assumption regarding phial formulation and packaging cost, followed by API cost (table 2). If the assumed cost of phial materials and formulation is changed from the current ‘competitive formula’ assumption (US$0.09/phial) to the highest available estimate (US$5.00/phial), the estimated price of RHI triples from US$48/year to US$151/year, but the prices of analogues approximately double from US$78–98/year to US$181–201/year (except detemir). Halving and doubling the estimated API price resulted in changes of –17% to +88%. Changing the assumed operating margin from the base case 20%–10% or 50% resulted in changes to estimated price of –8% to +25%. Based on these figures, we calculated an estimated cost of production of US$1.45–9.64 per item, depending on assumptions regarding the number of units sold and the proportion of items sold that contained 300 vs 1000 units of insulin (online supplementary appendix). It may be possible to profitably manufacture biosimilars of recombinant human insulin and insulin NPH for a price of US$72 per patient per year or less. Biosimilars of insulin analogues—lispro, aspart, glargine, glulisine and degludec—may be profitably manufactured for prices of US$133 per patient per year or less. With high levels of competition, our estimates suggested that prices could fall to US$48 per year for biosimilars of human insulin and US$78–98 for insulin analogues (table 1). Comparison of estimated prices with recent government procurement prices suggests that robust competition in the human insulin and insulin analogue market would lead to sizeable savings in most countries and that current manufacturers could set significantly lower prices while still making a profit (figure 2). Price estimates were based on observed prices of API exported from India for RHI, NPH and insulin glargine. For other analogues, assumptions for API costs were based on quotes from biosimilar manufacturers and similarities in structure and process. Given the high level of similarity in molecular structure and manufacturing process, the relatively high price quoted by biosimilar manufacturers for insulin aspart compared with RHI is likely due to differences in demand volumes. Nevertheless, we conservatively assumed that other analogues for which export data were not available were priced similarly. Our estimated prices included a profit margin, a margin to account for transportation and import costs, and a conservative estimate for biosimilar development cost, which we assumed would be recouped equally in resource-limited and high-income markets (rather than at differentiated margins). As a point of comparison, we also estimated the cost of production per item using expense reports from Novo Nordisk (online supplementary appendix), which yielded estimates that were similar to the estimates made based on API prices. The assumed API costs were in the middle of the range of production costs estimated for monoclonal antibodies (US$20 000–300 000/kg), which are much larger molecules and whose manufacture is more complex.18 31 The prices estimated for RHI were in some cases higher than the prices reported in the ACCISS study (figure 2A).4 This finding likely reflects a combination of conservative assumptions and ‘front-loading’ of the costs of bringing a biosimilar to the market (we assumed that these sunk costs were to be recouped in the first 5 years of sales), which the three big current manufacturers will likely have already recouped many years ago. This finding also suggests that in a small number of countries, insulin biosimilars may initially be marginally more expensive than the lowest prices offered by originators in some contexts. In some countries, where originators offer low prices, in order to encourage a competitive and sustainable market for insulins, new market entrants may need to be supported by procuring at prices that are slightly above the lowest prices available from an originator (such strategies are well established in HIV, tuberculosis and malaria32). Our estimated prices demonstrate that the price of biosimilar of insulin analogues (except detemir) would not be expected to be more than two times that of RHI, even given conservative assumptions regarding analogue API prices based on low demand volumes (table 1). Estimated prices for insulin analogues were 1.9–2.0 times higher than the estimated price for RHI (except detemir: 5.1–5.9 times higher). This price differential is far smaller than the differentials currently seen in LMIC markets (figure 2). Due to the high level of similarity in molecular structure and manufacture processes, the difference in API price between RHI and analogues is likely explained by the relatively young biosimilars market, differences in demand volumes, different levels of process optimisation, and other overheads such as regulatory costs. If this is true, then the price of API for analogues could rapidly fall to near the price of RHI API. Due to increasing rates of type 1 and 2 diabetes, global demand for insulin API could rise to more than 16 000 kg per year by 2025.1 3 In order to meet this increasing demand, new manufacture facilities will likely need to be built. The cost of these facilities is included in our estimated prices, as it is included in the assumed costs of bringing a biosimilar to market. Governments may offer additional incentives to develop local biosimilar manufacturing capacity, for example, in the form of tax incentives. Our estimates suggest that yearly treatment with biosimilars of human insulin or insulin analogues could have drug costs similar to, or lower than, current lowest prices for first-line treatments for HIV, for which major international treatment programmes have led to 19.5 million people receiving treatment in 2016.33 34 At the estimated prices, comprehensive treatment of an estimated 19 million people living with type 1 diabetes would cost US$0.9–1.4 billion per year using biosimilar human insulin and insulin NPH, and US$1.5–2.5 billion using biosimilar insulin analogues other than detemir. For comparison, LMIC antiretroviral sales were estimated to be US$1.8 billion in 2014.35 With the global insulin market estimated to be US$32 billion in 2019,4 significant savings would appear to be possible if insulins became available at the prices estimated in this analysis. The key limitation of our analysis is the large number of assumptions that were necessary in order to arrive at estimates of biosimilar prices. There are expenses in biosimilar manufacture that are not individually considered in this analysis, such as capital expenditures, quality assurance and control, registration costs, costs associated with adherence to manufacturing regulations, and maintaining an aseptic manufacturing process. However, we have included a conservative assumption for the total costs of bringing a biosimilar to market. In addition, many of these costs are likely to be already represented in the estimated costs of API, which are based on completed sales and/or price quotes. By removing the cost of paying a profit margin to a third-party API manufacturer, inhouse production of API or domestic rather than international procurement would likely reduce costs and result in lower prices, or afford manufacturers higher profit margins, than the prices estimated in this analysis. Similarly, the assumed cost of formulation for the ‘conservative’ formula is based on sales prices of finished phial products, which would also include capital, quality control and operating expenditures. Our estimated prices assume purchase directly from the manufacturer, including a mark-up for transportation costs. Final prices to patients or health systems may include additional mark-ups added during the supply chain.1 These mark-ups will vary between countries, as they may be subject to local negotiations, regulations and other factors. In some cases, these additional mark-ups can be very large. Beyond a margin for import tariffs and transport, we have not included estimates for these mark-ups as our estimates (and comparisons with current prices) are made from the perspective of government procurement. High supply chain mark-ups, where they exist, would be a priority target for cost-containment measures. We estimated sustainable prices for the 10 mL phial formulation and did not estimate the price of pen or cartridge formulations. This limits the ability to compare estimated prices with current lowest prices as reported by the ACCISS study, as the figures in the ACCISS study are reported for insulins in any formulation4 (figure 2). Our analysis is primarily focused on resource-limited countries, where the majority of insulins are formulated in phials.4 The added costs for producing other formulations, such as self-injections pens, could be the subject of future work. Given a robust, competitive biosimilars market, it may be possible to profitably manufacture biosimilar insulins at prices of US$72 per year or less for human insulin and US$133 per year or less for insulin analogues. In order for this to happen, multiple competitors would likely need to enter the market. Production costs are only one element and, as with HIV/AIDS, an important step will be political recognition that diabetes can benefit from large, international treatment expansion plans, as well as regulatory coordination and market shaping. The WHO prequalification of biosimilar insulins, if and when realised, is likely to significantly encourage global competition, but companies need to be sure that the insulin they produce will be purchased. It could be posited that more insulin would be purchased globally if biosimilars became available at the estimated prices, thereby expanding the market. We thank Dr David Beran and Dr Margaret Ewen for their support and thoughtful comments on drafts of the manuscript. , 2015. Access to insulin - current challenges & constraints. http://apps.who.int/medicinedocs/documents/s22269en/s22269en.pdf (accessed 27 Jul 2017). , 2015. Inequities and inefficiencies in the global insulin market [article online]. http://haiweb.org/wp-content/uploads/2015/11/ACCISS-Fact-Sheet-1-Inequalities-in-Insulin-Market.pdf (accessed 17 Jun 2017). , 2016. Insulin prices profile [article online]. http://haiweb.org/wp-content/uploads/2016/04/ACCISS-Prices-report_FINAL-1.pdf (accessed 27 Jul 2017).
. Generic treatments for HIV, HBV, HCV, TB could be mass produced for <$90 per patient. J Int AIDS Soc 2017;20(Suppl 5). , 2016. Insulin market profile [article online]. http://haiweb.org/wp-content/uploads/2016/04/ACCISS_Insulin-Market-Profile_FINAL.pdf (accessed 27 Jul 2017).
. 2014.HIV medicines technology and market landscape. 1st Edition. http://unitaid.org/images/marketdynamics/publications/HIV-Meds-Landscape-March2014.pdf (accessed 30 Jun 2018).
. Manufacturing process for insulin lispro. In: Walsh G , Murphy B , Biopharmaceuticals, an industrial perspective . Dordrecht, 1999:156–9.
. Aspart proinsulin compositions and methods of producing aspart insulin analogs therefrom [patent] , 2012.
. 2017.Apidra, INN-insulin glulisine [article online]. http://www.ema.europa.eu/docs/en_GB/document_library/EPAR_-_Scientific_Discussion/human/000557/WC500025246.pdf (accessed 28 Jul 2017).
. 2017.Tresiba : EPAR - Public assessment report [article online]. http://www.ema.europa.eu/docs/en_GB/document_library/EPAR_-_Public_assessment_report/human/002498/WC500139010.pdf (accessed 28 Jul 2017).
. Processes for refolding of insulin [patent] , 2011.
. Process for purifying insulin and analogues thereof [patent] , 2014.
. 2017.S.O. 3013(E) [article online]. http://www.nppaindia.nic.in/norms/press27dec12/so3013e-27-12-12.html (accessed 27 Jul 2017).
. 2009.Emerging health care issues: follow-on biologic drug competition. https://www.ftc.gov/reports/emerging-health-care-issues-follow-biologic-drug-competition-federal-trade-commission-report (accessed 28 Feb 2018).
. 2011.What you need to know about the follow-on biologic market in the U.S: implications, strategies, and impact. Thomson Reuters. http://www.aff.cz/wp-content/uploads/2011/05/White-paper-on-bios-Reuters.pdf (accessed 28 Feb 2018). , 2014. Understanding the pharmaceutical value chain. https://www.imshealth.com/files/web/IMSHInstitute/HealthcareBriefs/Understanding_Pharmaceutical_Value_Chain.pdf. (accessed 27 Jul 2017).
. 2017.Levemir, INN-insulin detemir. Scientific discussion [article online]. http://www.ema.europa.eu/docs/en_GB/document_library/EPAR_-_Scientific_Discussion/human/000528/WC500036658.pdf (accessed 28 Jul 2017).
. 2015.34th board meeting: market shaping strategy. https://www.theglobalfund.org/media/4200/bm34_17-annex1marketshapingstrategy_paper_en.pdf (accessed 28 Feb 2018).
. 2017.Fact sheet: latest statistics on the status of the AIDS epidemic [article online] http://www.unaids.org/sites/default/files/media_asset/UNAIDS_FactSheet_en.pdf (accessed 24 Jul 2017).
. 2016.Untangling the web of antiretroviral price reductions, 18th Edition [article online]. https://www.msfaccess.org/sites/default/files/HIV_report_Untangling-the-web-18thed_ENG_2016.pdf. (accessed 27 Jul 2017).
. 2015.ARV Market Report: The State of the Antiretroviral Drug Market in Low-and Middle-Income Countries, 2014-2019. http://www.clintonhealthaccess.org/content/uploads/2015/11/CHAI-ARV-Market-Report-2015_FINAL.pdf. (access 27 Jul 2017).
. 2017.WHO to begin pilot prequalification of biosimilars for cancer treatment [article online]. http://www.who.int/mediacentre/news/releases/2017/pilot-prequalification-biosimilars/en/ (accessed 11 Jun 2017). Contributors DG designed the study. DG and MJB collected and analysed the data and drafted the manuscript. AH provided critique of the manuscript. Funding This analysis was funded by the ACCISS study, which is funded by The Leona M and Harry B Helmsley Charitable Trust and Stichting ICF. Disclaimer The funder was not involved in the conduct of the study or the decision to submit. Representatives of the ACCISS study provided comments on the manuscript but did not make the final decision to submit for publication. The analysis in this paper is that of the authors alone and does not necessarily reflect the views of the Helmsley Charitable Trust or Stichting ICF. All references and conclusions are intended for educational and informative purposes and do not constitute an endorsement or recommendation from the Helmsley Charitable Trust or Stichting ICF. Data sharing statement Further data may be obtained from the corresponding author.